[i]f someone tells you ‘you will be completely anonymous, [because] you’ll have VPN running all the time’, that’s a lie. [a]nyone who runs a large enough IT infrastructure knows that running that infrastructure with ZERO logs is impossible. 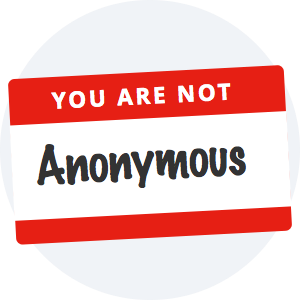 The “anonymous” or “no logging” VPN Providers have diverted privacy-conscious VPN users to focus on the false promise of anonymity instead of focusing on what really matters when choosing a VPN provider: transparency, trust, ease of use, performance and reliability. We hope dispelling some of these common myths will lead to a more transparent and frank discussion about privacy in the VPN industry and on the Internet in general. Anonymity is defined as not being named or identified. 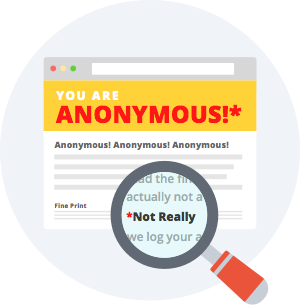 You are not anonymous when you are online, even when using privacy tools like Tor, Bitcoin or a VPN. Every service has at least one piece of information that can be used to distinguish different users, whether it’s a set of IP addresses (VPN and Tor) or a wallet (Bitcoin). This information alone may not reveal any private details about the user, but it can be associated with other similar information to eventually identify an individual. 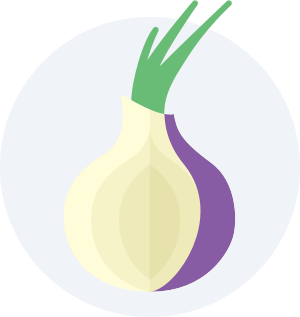 Several publications have correctly pointed out that neither Tor nor Bitcoin make you anonymous. A VPN doesn’t make you anonymous either, but does greatly increase your privacy and security online. A VPN is similar to the curtains for the windows of your house. The curtains provide privacy for activities happening inside your house – even though your house address is public. [p]rivacy is your right and ability to be yourself and express yourself without the fear that someone is looking over your shoulder and that you might be punished for being yourself, whatever that may be. Golden Frog doesn’t advertise or promise that VyprVPN makes you anonymous on the Internet. Golden Frog does advertise that VyprVPN will greatly improve your privacy and security online. Services that claim to make you anonymous attempt to eliminate any identifying data (which is not a realistic goal, as discussed in Myth #1). However, services designed to protect privacy instead allow users to control access to their personal data, but do not eliminate all identifying data. 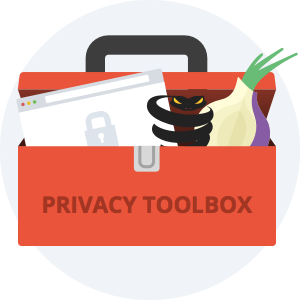 Internet users can use private web browsers, proxies, Tor, encrypted messaging clients, VPNs and other great tools to increase their privacy online. These privacy tools help defend against mass surveillance by governments or by private corporations “deputized” to collect information at the direction of the government (in the United States companies such as AT&T, Verizon, Time Warner, Comcast). But none of these tools, alone or in any combination, make you anonymous. Online privacy through secure communications is a realistic goal, but anonymity is a false promise. …basic steps will encrypt your hardware and … your network communications [making] you…far, far more hardened than the average user – it becomes very difficult for any sort of a mass surveillance. You will still be vulnerable to targeted surveillance. If there is a warrant against you, if the NSA is after you, they are still going to get you. (emphasis added) But mass surveillance that is untargeted and collect-it-all approach you will be much safer. Golden Frog build tools, such as VyprVPN paired with VyprDNS, to help encrypt our users’ Internet connections against mass surveillance and provide security. However, Golden Frog doesn’t advertise or promise that VyprVPN will make you anonymous on the Internet. A VPN Provider in the UK that advertised an “anonymous service” on its website was outed for turning over customer information about a LulzSec Hacker to the authorities. As you will read below, limited VPN logging is not necessarily bad, as it helps the VPN provider troubleshoot customer issues, prevent abuse of its IP space and network and offer different VPN plans (such as multi-device or GB limited plans). But advertising one service and delivering another service is wrong. Golden Frog is transparent about what data we retain. Anyone that runs server infrastructure knows running infrastructure with ZERO logs is extremely difficult, if not impossible. Now imagine how hard it would be to eliminate logging if you DIDN’T run your own infrastructure and instead rented your VPN servers and network from 3rd parties! Aside from Golden Frog, virtually all VPN providers in the world do not run their own infrastructure. Instead, VPN providers “rent” their servers and network from a “landlord,” such as a hosting company or data center. 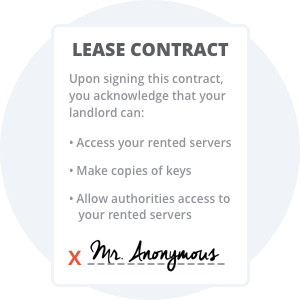 When the VPN provider “rents” instead of “owns,” how can it guarantee that its “landlord” will respect the privacy of its VPN users? In the forum of a different VPN Provider, a discussion thread conveniently disappeared when a user questioned whether users can trust data centers to not log. In 2016, another VPN provider, Perfect Privacy, had two of its servers seized by police in the Netherlands. In this instance the authorities went straight to the hosting provider to obtain the hardware, bypassing the VPN provider completely. This again illustrates the danger of using third parties. If a provider uses third-party hosting and isn’t even contacted when the servers are seized, how can they possibly ensure your data and information are kept safe? How can the “Server Renters/Cloud” protect their users from their hosting companies taking snapshots of their machines for backup purposes, DDOS purposes, or at the direction of law enforcement? How can “server renters” prevent a live migration of the hosted VPN server in which an entire image is taken of the computer, including operating system memory and hard drive, especially when live migrations can be invisible to the VPN Provider? What happens to the data when the hosted machine is no longer used by the VPN provider? If you don’t own the server, how can you be sure your landlord doesn’t have a key or backdoor into the hosted server? Golden Frog doesn’t “rent” servers but instead owns and operates 100% of our VPN servers, secured physically using keys, biometrics and software. Together with our sister companies, Data Foundry – a global data center provider and Giganews – the world’s leading Usenet Provider, we have been in the Internet business since the dawn of the Internet over 20 years ago. We have the experience to run our own infrastructure on a worldwide basis, and the financial stability to make the financial investments to engineer privacy into our infrastructure. It is impossible to engineer privacy into your service if you don’t own and operate your own infrastructure. Most VPN providers (except Golden Frog of course!) don’t run their own network and instead let hosting providers run the network for them. “Running your own network” means you own and operate the router and switches. 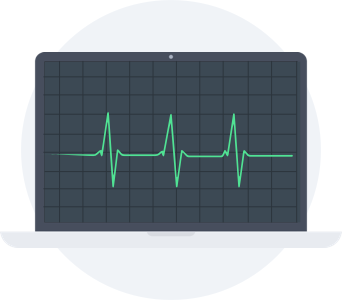 If your VPN provider does not run its own network, you are susceptible to their hosting company listening for traffic on both inbound and outbound connections. Listening to Internet traffic allows for a tremendous amount of correlation and identification of user activity. 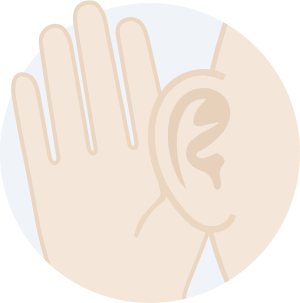 For example, if you listen to two people talk in a restaurant you can learn enough from the conversation to identify who is talking – even if you don’t know their identity when you start listening. If a VPN provider does not run its own routers, then it can’t control who is listening to its users. Even worse, a “no-logging” VPN provider recently admitted that it used a “packet sniffing” software to monitor traffic to prevent abuse. We own and operate our worldwide network. Besides faster speeds and increased reliability, running our own network offers VyprVPN members more privacy. Imagine if you connected at home directly to the backbone Internet providers allowing you to bypass your snooping ISP. That is effectively what happens when you connect to VyprVPN. Not only do we encrypt the connection from your house to our servers, we connect to multi-backbone Internet providers. This makes it impossible for someone to listen to inbound connections and exceedingly difficult for anyone to listen to outbound connections because we typically have three different paths to the Internet backbone from our servers. This is a large part of what it means to run your own network. By logging a minimal amount of data, VPN providers can vastly improve your experience when using a VPN. VPN providers should only retain the minimum amount of data to operate their business and delete that data as soon as they don’t need it. Golden Frog only retains the minimum amount of data to operate our business and we delete the data as soon as we don’t need it. That’s it. That’s all we we log. We own our own servers, our own DNS (VyprDNS) and manage our own network so we can deliver on this promise to our customers. In addition, Golden Frog is incorporated in Switzerland, which offers favorable online privacy laws that we use to protect users. We are committed to operating a blazing fast, high quality infrastructure that allows VyprVPN to remain a respected tool for online privacy and freedom. Facebook bought a VPN app called Onavo in 2013. Why would Facebook buy a VPN app? Because the VPN functionality gives the app visibility into the network connection for the entire phone. Consequently, information such as URLs and app usage is exposed, and Facebook can examine user activity for their own purposes. The price of free is just too high. Hola is yet another offender masquerading as a privacy company. Hola offers “secure browsing” to its users, but was recently revealed to be selling the bandwidth of its free users without their knowledge, effectively turning them into a botnet. Most proxies don’t encrypt your Internet connection, and to operate they have visibility to each and every URL you visit. A recent blog post that analyzed the security of free proxy services determined that only 21% of the over 400 services examined weren’t “shady,” and over 25% of proxies modified the web code to inject ads. 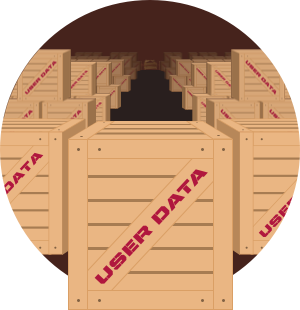 Many companies who offer services to help you be “anonymous” online actually collect a great deal of personal and identifying information on their users – information which they could sell. As a recent study pointed out, some VPN products can suffer from IPv6 leakage and DNS vulnerabilities, causing many users to think twice about relying on a VPN to protect them online. However, not all VPNs are created equal. When it comes to the IPv6 leak, only VPNs that run through IPv6 are in danger, and those that use 3rd-party clients (which Golden Frog does not do) are most at risk. As for the DNS vulnerabilities, most VPN providers don’t offer their own DNS servers like Golden Frog does. When DNS requests are sent over 3rd-party networks to 3rd-party DNS servers, users are more vulnerable to monitoring, logging or manipulation. Golden Frog’s apps are built by an in-house Dev team to deliver better control over security, such as preventing IPv6 leakage. Golden Frog runs its own DNS service, called VyprDNS, so DNS requests cannot be monitored, logged or manipulated by 3rd parties. Tor has even accused the FBI of paying Carnegie Melon $1 Million to use their “Tor-breaking research” to reveal the identity of some of the service’s users. Golden Frog doesn’t advertise or promise that VyprVPN makes you anonymous on the Internet. Golden Frog does advertise that VyprVPN will greatly improve your privacy and security online. We allow users to protect themselves online without sacrificing speed or ease of use. Netizens of the world must arm themselves with the tools to protect their information and identities online. A global commitment to a free and open Internet will help us foster global prosperity and promote peace.